Praised by musicians and critics worldwide, David Burgess is recognized as one of today's outstanding guitarists. His international appearances as soloist and chamber musician have taken him to concert halls throughout North and South America, Europe and the Far East. Highlights of recent seasons include several concert tours of Europe, repeated recitals in New York, Philadelphia, Washington DC, Baltimore, Boston, Seattle, Los Angeles, San Francisco, San Diego, Denver, Phoenix, and Nashville, along with numerous appearances as an orchestral soloist, including featured performances with the Philharmonia Virtuosi of New York, and the American Chamber Orchestra at the Kennedy Center. First prize winner in the Andrés Segovia Fellowship Competition in New York City, he has also won top honors in the Ponce International Competition in Mexico City, the Guitar ‘81 Competition in Toronto and the 31st International Music Competition in Munich. 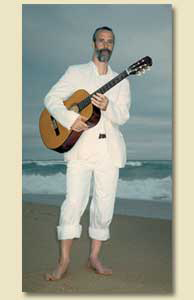 Mr. Burgess began studying guitar at the Estudio de Arte Guitarrístico in Mexico City with the renowned Argentine guitarist Manuel López Ramos. He received a Bachelor of Arts degree in music at the University of Washington, and later earned a Diploma di Merito, while on full scholarship at the Accademia Musicale Chigiana in Siena, Italy where he studied with Oscar Ghiglia. From 1984-1987 he periodically received classes from the great Spanish maestro, Andrés Segovia. Through his extensive travels in both Spain and Latin America, Mr. Burgess has explored traditional guitar styles, along with many popular and folkloric types of music. He has acquired one of the largest collections of Latin American guitar music in the U.S., from which he often draws interesting and unusual works for his programs. A former guitar instructor at the University of Washington, and the Cornish Institute of the Arts, Mr. Burgess currently resides in New York City where he has performed at Town Hall, Carnegie Recital Hall and Lincoln Center. He has recorded for Musical Heritage Society, Tritone, Athena and Camerata Records and has also recorded Rodrigo’s Concierto de Aranjuez with the Philharmonia Virtuosi on the CBS Masterworks label.